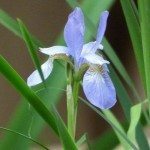 How long can I leave iris rhizomes out of the ground before planting them? 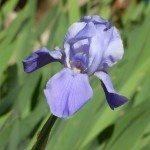 I was able to dig out a bunch of irises but wanted to give some to my friend and plant others on another property. I am not sure if I will be able to do so before Wednesday or Friday. Is there a way to save them for a few days? What is the best way to protect them until planting? Here is an excellent link for you with more information. Cool dry location is important.